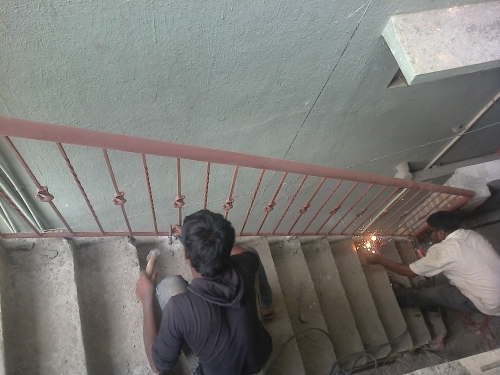 In below picture railing started with one design rod. It will look good if you keep this kind of design rod at the starting of railing. Cast iron pieces will give very good look for the grill design or railing designs. You need to select the design which suits for your house based on the elevation plan. You can use them in gate as well. In K. R Market, Bangalore vendors will sell this in KGs. When I brought this from market, one item ws costing around 65/- per KG and another item was costing around 85/- rupees. This peacock Cast Iron design I brought from K.R Market, Bangalore. If you want to bring big items by pulley, it is better to keep a gate like below and when ever it is required you can open that gate. This will enable to bring material to top floors. This will be useful in case if you are having small staircase. Observe below figure keenly.